This top was inspired by the gauzy, frothy, crystal and flower embellished creations that we’ve seen this summer. I wanted to take an ordinary top and give it a sparkly finish. The intention was to cut flower shapes from a stiff fabric such as tulle, taffeta, organza or netting. 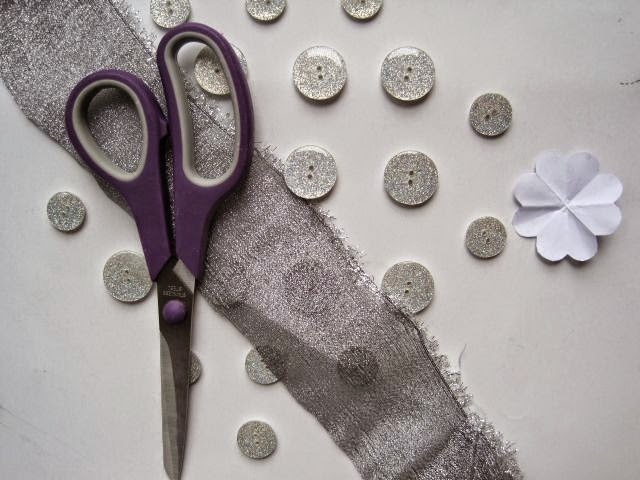 The fabric I used here is called crystal organza. I wanted to sew floral fabric shapes in place with a crystal button. Flower shapes are easy enough to cut from paper but I found it a whole lot harder cutting them in fabric. The stiffness of the fabric made folding difficult and the fabric was also slippery. I could get flowers, but trying to cut uniform shapes wasn’t working. I abandoned the idea of flowers and instead cut squares, then took the corners off them making them – octagonal – in shape. The next problem was getting more than 10 buttons that were the same. Haberdashery supplies in Aberdeen in Scotland are limited. I had to use the same buttons but in two different sizes. Next time I might use beads and larger shapes like I did when I made flower brooches – see how-to here. The thing with DIY’s is that you figure out what you should have done after you’ve done it. But then that’s with all things. I might also try cutting out patterns from a piece of lace or go for a vivid colour fabric, like hot pink, and make bigger shapes that cover the entire front of the top. Larger cutouts could make it possible to have flowers after all. 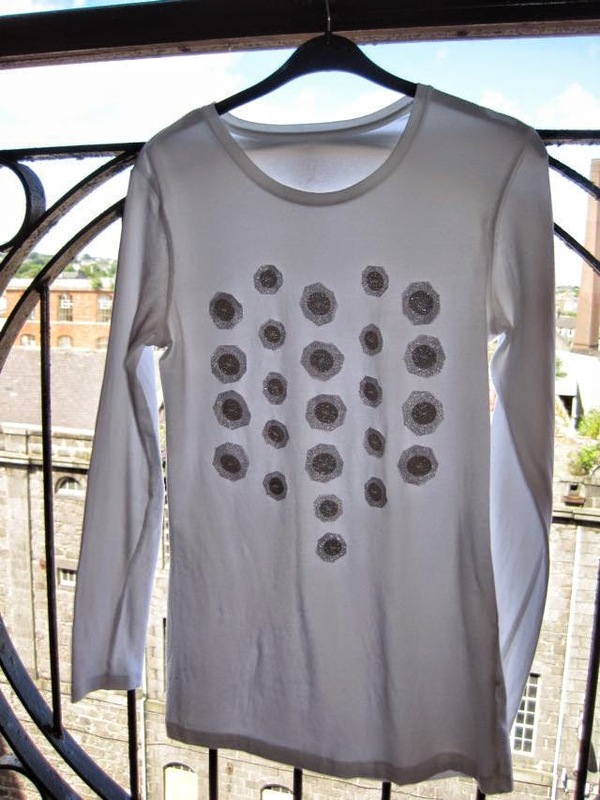 So once I had my shapes and my buttons, all I had to do was arrange them on the front of this top so they were symmetrical. I pinned the fabric pieces in place and then sewed the buttons to the fabric and the top. Easy peasy. Here – and – here – are more flower embellished tops to inspire you. I would love to see your creations. Share them on the Greenie Dresses for Less facebook page. And you can see newer and older projects by going to the Greenie Galleries at the top of this page.